Things I liked: Excellent clarity even at full zoom provided you adjust the objective properly for your range. Able to see close targets well. Incredible bang for your buck. Things I would have changed: The ranges listed on the AO wheel are not perfect, but get the big side wheel and you can remedy that. What others should know: Tough call between high and medium rings. Medium rings will work, but they may not work with the removable lens cover. Things I liked: Tool free turret adjustment without any protective caps to remove. The lack of caps might be considered a con by some tho. SWAT. Low profile battery compartment at the rear of the scope. Things I would have changed: Make it stand up to a super magnum. It's definitely not Hatsan Torpedo 155 rated!!! Talk about frustrating to have the POI constantly changing. Starts off well enuf but under extended shooting the POI goes all over the place. I shouldn't be able to shoot better groups with open sights at 25 yds. Wasted more than a day of shooting, not to mention pellets, testing the accuracy of various pellets only to find out that the scope wasn't holding a zero! Aggravating in the extreme!!! What others should know: Don't put it on a super magnum!!! Things I liked: Solid clicks, accurate tracking, holds up well, reasonable cost, side parallex adjustment, does what its supposed to do. Things I would have changed: This is all nitpicking stuff...I would prefer finer crosshairs for 100 yard shooting, but in a hunting situation and at more reasonable distances these are fine. AO range marks are a little off. What others should know: Ive had 2 of these scopes for over 2 years now and not a bit of trouble with either one. Its a good solid first scope for my PCP rifles. I only stepped up to a more expensive scope because I needed a finer crosshair for very long ranges. Otherwise, I would buy another for my new high end PCP. Things I liked: The image in the scope is excellent for a scope in this price point. The reticle and mildots are thin and won't block you view of small targets. Using the adjustable objective (and the optional 100 mm focus wheel) I can accurately determine the range of my target out to 55 yards The spacing of the mildots is accurate, which makes this scope excellent for field target use. What others should know: I have mounted this scope on my Benjamin Marauder, which make a nice combination for field target competition. Things I liked: The 4-16x56 I received is very much up to my expectations. Quality of materials (given the price point) and machining are very good in my opinion. Assembly is excellent. The optics on my scope were great across all magnifications and distances; no ghosting, fisheye, or dark edges. The 56mm objective lens gathers more than enough light to make up for magnification extremes and low light conditions. I do like the memory feature on the illumination. Things I would have changed: I'd really like to see an increased eye relief. For some reason I just need to have about 4" and this scope is at about 3", the industry standard. I realize everyone might have a different opinion but 36 colors? Red has always been just fine for me as long as I can adjust brightness. I didn't base my decision on that and I'd recommend it be about the last thing one considers. As I said above I do like the memory feature on the illumination though. What others should know: Sidewheel & AO Turret: The alignment of the optional sidewheel's markings with the parallax turret markings that have been the case of many negative comments were not an issue. The 110mm Big Wheel I received lined up perfectly with the markings on the turret. It takes a bit of fiddling to find the right sprocket alignment but mine lined up perfectly. I'd have to say that Leapers UTG finally took note and spent a bit more QA aligning the wheel's hard rubber sprocket to the turret. There is a bit of slop in the movement but its not a metal to metal contact so I'll accept that the interface causes that. 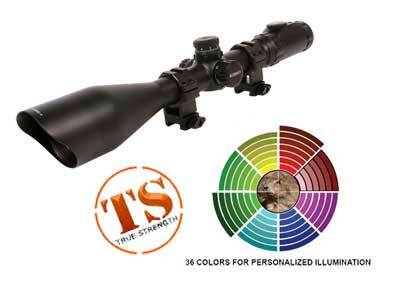 I don't expect a scope at this price point to "tune" as $1K scope or even a $400 scope. Things I liked: I just got this scope and this is not a full review but I am posting this to answer some questions that might interest some. The etched reticle has a much finer crosshair that the standard model. That is what I was after and rolled the dice and won. This scope is quite a bit larger than the 4-16x44mm model. It's a big scope. I mounted it to a Gen 1 Marauder using UTG medium 30mm mounts. The front bell barely clears the barrel w/o the scope cover. With the scope cover its a no go as it pushes the barrel shroud down. So no front scope cover with medium mounts but it lines up well with my eye with my cheek on the stock. Out of the several other UTG scopes I have this is the clearest. I spent a little more than the standard 4-16x44mm standard model with SF (which I currently own) but it was well worth the extra $$. Things I would have changed: It is a big heavy scope. I would not recommend this for a rifle you want to drag around hunting all day. I bought this for field target so weight is not and issue and for my use a plus. The reticle is very fine. Again great for target work, much better than the non-etched reticle models. This may not be the best for reticle hunting but it does have the lighted reticle so that should overcome the fine reticle for hunting. What others should know: Though I have the side wheel installed I have not done any ranging work with it yet so I can't tell you how well/consistently is ranges. Things I would have changed: It is a bit heavy to carry a lot, but 99% of my shooting is from the bench. Perfect for that.. Things I liked: Great scope. 56mm makes a hugh difference. Things I would have changed: Nothing. Works great like it is. What others should know: You can use medium 33mm rings, but youll have to shim it so it doesnt touch the barrel. Things I liked: This is a great scope for the money. I have purchased two of these fine scopes. The illuminated reticle gives the best vision on target no matter the background. Takes a beating from my .30 Caliber Springer and still holds up. Things I would have changed: I wish I had purchased this scope for all my Airguns. Works well on pcp or springers. What others should know: The UTG Accushot is great for punching holes or bring home the game. Can't beat it for features for the bucks. Things I liked: Value for the money. Ease of adjustment. This scope has a lot of options. Fits atop of my .25 Marauder nicely. Can not believe how accurate the AO is out to 50 yards. Makes a great FT scope. The 75 and 100 yard marks are on the money too. But you don't have the precise in between yardage marks as you do with 50 yards and closer. Things I would have changed: Weight. This is a big, heavy scope. The AO side knob is hard to turn while sighting a target. But I added a wheel and it's now a piece of cake. I leave the scope set at 10x for ease of calculating mill dots. The adjustment is a two handed cranking on the whole scope to change settings. I don't know why it has to be so tight. Even the user manual says not to loosen any thing to make it easier to turn. What others should know: It's a 30mm tube and 56mm objectives, you need tall rings. Things I liked: Have this scope mounted on my Hatsan Bullboss .25 cal. At 30 yrds can do dime size groups. This is my first etche glass scope and the difference between this and a regular mil-dot with the wire reticle is night and day. Cross hairs are thin which lets you see more of your target at longer distances.The mounting rings that came with the scope were perfect for my purpose (mounting on a bull-pup). Things I would have changed: At dusk when the sun is low, there tends to be glare on the scope. The sunshade needs to be a little longer or UTG should make a sunshade that would screw it the end.There are thread there so it may be possible although it may reduce the field of vision..
What others should know: Barring the sun issue, this is a great scope for the price and I would recommend it highly. Things I liked: It is an excellent scope. It has a 20x 1/2 mil-dot reticle which is very confortable to aim. What others should know: You will never find a scope with so great features like this one for less than 200 US$. It is really a gift. Things I liked: workmanship of the product, I love the lighted reticle, the focus, range finding feature, and clear objective. Oh one more thing, The price is about half of another scope that I am currently using. What others should know: The scope comes with perfect mounts that matches the finish on the scope. Things I liked: Excellent scope, I've had it mounted on several springers and it has done an outstanding job on all of them. Mine is currently mounted on a Walther LGU. I tried other scopes on the LGU but had problems with the scope bells being in the way when loading pellets. The cut away on the sun shade of the UTG 4-16x56 allows for non-restricted access to the loading port. What others should know: This is a heavy scope, especially when combined with a Leapers Accushot 1 Piece 30mm High Mount and a 80mm Swat Wheel, but the LGU is a heavy rifle. This setup is perfect for target shooting. For hunting you may want something lighter. Also be aware that 56mm scopes need high mounts, therefore if you have a low non-adjustable cheek rest, inconsistent cheek weld could lead to accuracy issues. Things I liked: I really like this scope for my air rifles and .22 rimfire. I have 4 of them (2 for rimfire and 2 for pcp air guns). I also like the side wheel (SWAT) because I can adjust the objective focus without taking my eye off the target to make an adjustment. This makes my adjustments quicker and more accurate. What others should know: For the UTG scopes, the SWAT feature is only available on the 30 mm tube scopes. This is probably because the side wheel linkage would not fit inside a 1 inch tube. I have found that I need to purchase other scope mounting rings to allow me to use dovetail rather than the weaver rings that come with this scope. This is because weaver adapters & rings generally raise the scope too high for a good cheek weld and desired scope height. What others should know: I have this scope on my Benjamin Marauder .25, great match. Along with BKL mounts. Things I liked: Ease of use, setup, tough unit. 50 yds and under night or day under x10 power clear as you can want. 20yds, x8pwr, red filtered streamlight stinger 2230pm you can see tree bugs moving. Next purchase will be a x32 for more clarity. What others should know: These also work great with a streamlight stinger mounted across the top, wow you talk about being able to see, with or with out a red filter, along with colored crosshairs, night shooting is just as much fun as daylight shooting. Things I liked: The scope works and is shock resistant. I like having the use the yellow & medium blue colors in the IR and the reticule is top quality plus the scope is clear from 4-16 magnification. Things I would have changed: The type of sloped objective bell sunshade on this scope does not work. Sure it looks better than a 5" tube extension it just is not even close to being effective. So we have a scope with an illuminated reticule for dusk & dawn use yet within 25-30 degrees of the sun the scope gets glare at dusk and dawn making this scope pretty useless for hunting and in my case for target practice at dusk when the wind dies down as my target range faces west. Calling what this scope has a sunshade is like calling a folded piece of paper a portable air conditioner. UTG should make a functional sunshade for these scopes, perhaps a beefed up extended version of the existing lens cap. If you plan on using your rifle for hunting you need a scope with a 5" tube sunshade as this design is just so restrictive in its usefulness. What others should know: I purchased a 100mm focus wheel for mine that pulls the it out of focus when shooting perhaps because it is not balanced, but since i am using it with an air rifle at under 100yds i just switched to a 60mm wheel however if i were using it on a firearm where 200 or 300yds made the precision of the 100mm wheel necessary. Maybe the 80mm wheel if it is balanced enough. What others should know: If it were not for bad luck I would have no luck at all. I had exchanged a 4-16x44 30mm Accushot which blurred above 9x for this one hoping to have a side adjust scope on one of my RWS 34's but it was not to be. I could sight it in and stack pellets at 25 yrds. but after 10-20 shots the poi was all over the place. I had lock tighted the rail and rings and when the poi changed I would check screws and they were tight & secure. Thinking the scope had not had time to "settle in" I would resight and get an excellent group again but then it would go south. I had enough and Cory at PA was super in working with me to exchange it for a 4-16x50 scope barrel adjust AO as is on my other tack driving 34 but I will really miss the side adjust feature. I am glad others are having good luck with their 30mm Accushot series but mine has not been good. Things I liked: Is perfect for my air airforce rifle. Just you will need to buy new mounting rings with 11mm dovetails to fit(I used BKL-300 0.6" Long Dovetail Rings). Things I liked: It's a beautiful design and I like the ergonomics especially after mounting the optional wheel. Can't go wrong with the etched glass reticle. It's very crisp with the mil-dot. The 30mm lets in a lot of light but I have not tested this model in a low light. Things I would have changed: I'd like to see a more forgiving depth of eye relief. I'm not sure about the terminology but the sweet spot is very shallow as you progress deeper into the magnification. It's the only criticism that I'm aware of and it's just something that you have to expect and get accustomed to. What others should know: I purchased this model as well as the 6-24 in the same scope. Mounted this one on a .22 Marauder and the other on the .25. using same high-ring setup on 11mm mount. For some reason, the 6-24 topped out at just about zero at 25 yards so I guess I'll shim or find a different rear (or front) mount. I've owned Leupold scopes all my life and in good light, the clarity is similar. The proof will be in low light. I'm very pleased with the scope so far. Things I liked: 30mm tube brings in lots of light , target turrets are easy to use. Overall nice scope. Things I would have changed: Needs adjustment for diopter for an individuals sight capability. Extra sunshades are not available. The 36 color option is something i personally would never use although the mill dot crosshairs are pretty fine then the lighted crosshairs come into play. I did finally find the diopter adjustment it blends so well that it was hard to believe it was there? It was also screwed in very tight which lead my to think it wasn't there.Thanks for the advice. Diopter is adjustable, remove rear scope cap and i know it looks like one piece how ever try and turn it i assure you as i have one in front of me it does adjust. I admit the 36 colors are mostly of little use though the ones along the left line on the chart Yellow, Magenta and one of the brighter blues will be useful in more dense trees & foliage in some lighting conditions. and that sunshade i have to admit is going to not be enough in some dawn & dusk with sun rise or set situations it looks good but looks do not matter & what it needs is a 5" sunshade.